Spring is the perfect time to prepare your vermicomposting worms for the upcoming warmer weather. You need to make sure the worms are breaking down accumulated scraps. When do you need to add fresh adult worms to speed things along? When should you harvest the worm castings, and how? How do you use organic compost? Do you need a different compost bin? Should you add bedding, and how? Find out the answers to these questions and more below. What is the First Step? Once it gets warmer with no chance of frost, check out your composting bin. It’s the best way to plan for the revival of your mostly dormant composting worms. You need to take stock of your worm inventory. What should you NOT feed your composting worms? At Uncle Jim’s Worm Farm, we supply our customers with the finest composting worms. 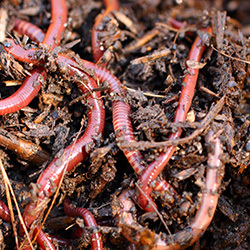 We recommend our quality Red Worms or European Night Crawlers for vermicomposting. Vermicomposting is a great way to get rid of organic waste. It’s good for the environment and produces valuable compost for plants. We want to make sure that not only are our customers happy, but also our worms. Healthy worms make for the most effective composting. Whether you are composting indoors or out, irritating little fruit flies sometimes invade your house. Exposing organic matter to the air attracts drosophila melanogaster. Even fresh fruit on the countertop or in a fruit bowl brings them on. How do fruit flies get into the house? How can you prevent them? What can you do to get rid of them? Uncle Jim’s Worm Farm has been dealing with this question for over 40 years. Types of Composting Most households choose to compost kitchen scraps outdoors. They collect wasted organic material a pail or container with a lid. After some scraps have accumulated, they dump the scraps into a larger outdoor composter. This could be a pile, a rough structure made from scrap materials, a tote(link), a composter purchased from a store, or a composter bought online. 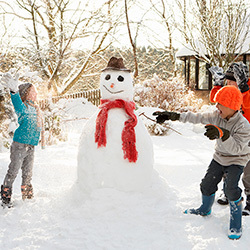 How Do Composting Worms Survive the Cold Winter? Composting worms help break down food scraps, but how do they survive the cold winter? Any vermicomposting bin set up in a northern state is likely to freeze. Will all the worms die? Should you try to save them? If the worms die, will there still be worm castings for fertilizer in the Spring? Should you bring them indoors? Did you know that there are different types of composting? Aerobic composting and vermicomposting require ventilation. Anaerobic composting works without oxygen. How do you make compost? Which type is best for households, farms, businesses, institutions, and schools? How Composting Works Composting takes advantage of the natural process of decomposition. When leaves drop on the ground in the fall, Mother Nature breaks them down. Ants and other insects, bacteria, and fungi do their work. Soon, nothing remains except brown matter, which becomes part of the topsoil. This rich organic matter nourishes plants, helps regulate water saturation, and creates air pockets. When something goes wrong with your worm composting bin, this Troubleshooting Guide can help! Bookmark this page and return whenever you think something is amiss with your worm bin. Uncle Jim’s Worm Farm is the #1 supplier of composting worms in the USA. We’ve been growing and selling worms for more than 40 years. Click on the problem to see solutions.